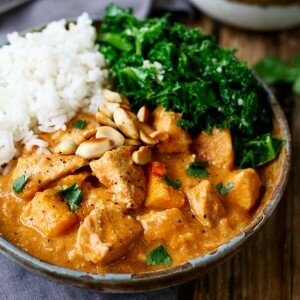 African Chicken and Peanut Stew – This African Stew is a slightly spicy, nutty stew that can be eaten on its own, or with rice. The word stew generally evokes thoughts of cold winter evenings with the fire blazing. So you might think I’m a bit strange for posting this one in Spring. 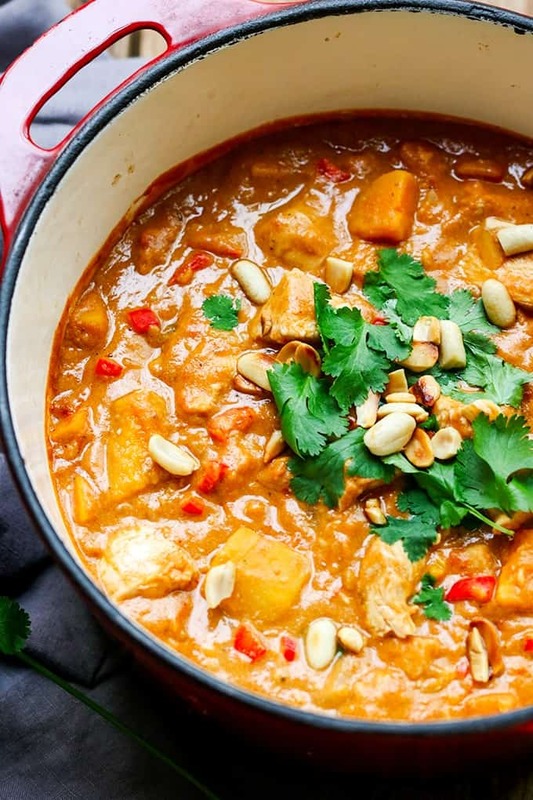 However, this is more of a light, nutty curry than a hearty-filling stew. 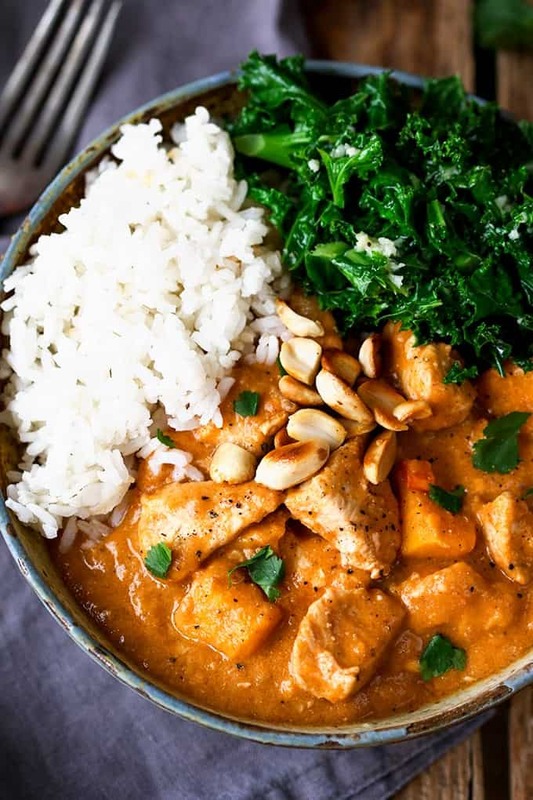 Chicken, spices, peanut butter, sweet potato and a few other goodies, all combine to make a tasty dinner. 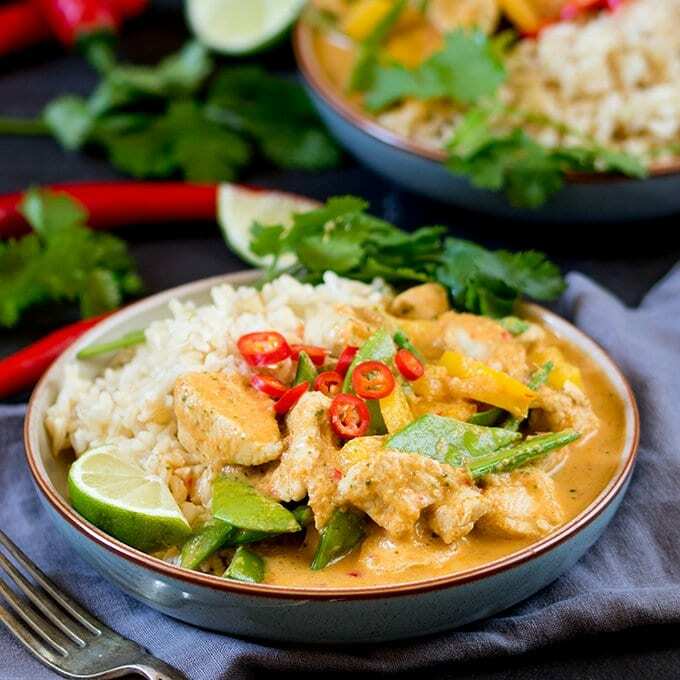 Whilst the peanut butter and coriander hint at a slightly Thai dish (Thai being one of my favourite cuisines – like this Mee Siam , Yellow Curry, Peanut Pork or this Laksa), it’s the addition of tomatoes, stock and sweet potato that really brings it closer to a more traditional African stew. 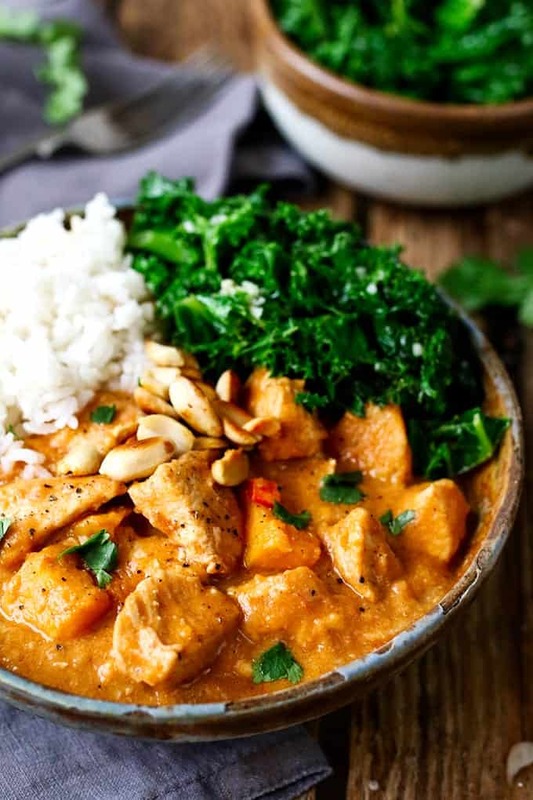 Serve this African peanut stew with some toasted peanuts, garlicky kale and boiled rice. Sooo good! 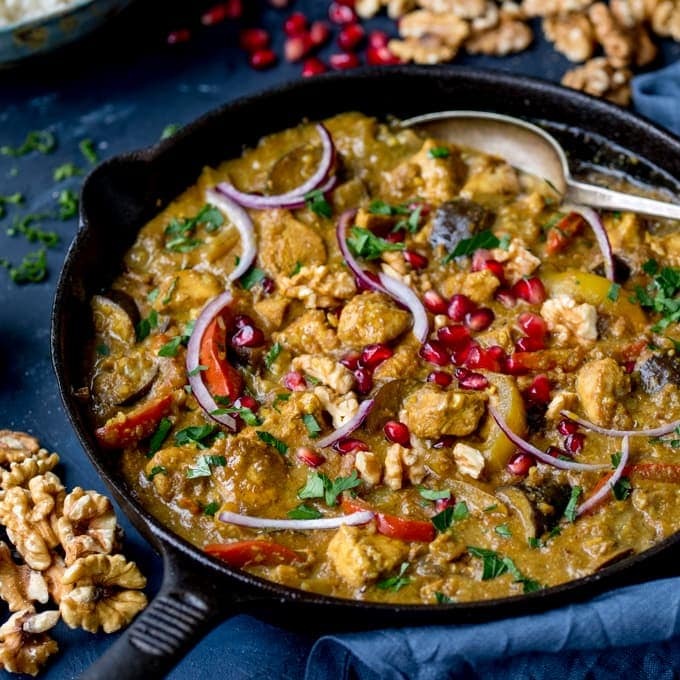 This African Chicken and Peanut Stew is a slightly spicy, chicken and peanut stew that can be eaten on its own, or with rice. Heat the oil in a large frying pan or dutch oven. Add the onion and cook for 5 minutes on a medium heat until they start to soften. Add the garlic, ginger, salt, pepper, cayenne pepper, ground coriander, chilli peppers and bay leaf. Stir and cook for a further 2-3 minutes. Turn the heat up to high and add the chicken. Stir so the chicken is coated in the spices, and cook for 4-5 minutes, stirring regularly, until the chicken is sealed. Add the peanut butter, stock, canned tomatoes and sweet potato. Bring to the boil, turn down to a gentle simmer, then place a lid on the pan. Simmer for 30 minutes, stirring every so often. After 30 minutes, take off the lid, remove the bay leaf and add in the chopped peanuts. Cook for a further 2 minutes. (you can cook for longer with the lid off if you want the sauce to be thicker). Turn off the heat and serve with rice, coriander and toasted peanuts (and some kale if you like). * To make the toasted peanuts, simple dry-fry them in a hot pan for a minute or two (keep and eye on them, as the burn quickly). When they're browned, place on a plate to cool. ** To make the garlicky kale, simply add a large bag of washed kale to a pan with 1 clove of minced garlic, 3 tbsp butter and 3 tbsp water. Stir, then place a lid on the pan and heat on high for 2-3 minutes until the kale has wilted. Nutrition info is for one serving of this recipe, and does not include the serving suggestions of rice, toasted peanuts or garlicky kale. Delicious. A favourite now. I left out the cayenne pepper and bay leaf and added a little curry powder and tumeric. I just made this dish and it is so delicious! I made it as written with the exception of no chilies or bay leaf, because I didn’t have any on hand. Really great recipe. Thank you. Googled it this morning. Cooked it this evening. Fantastic! Served with kale and rice. Top dinner. 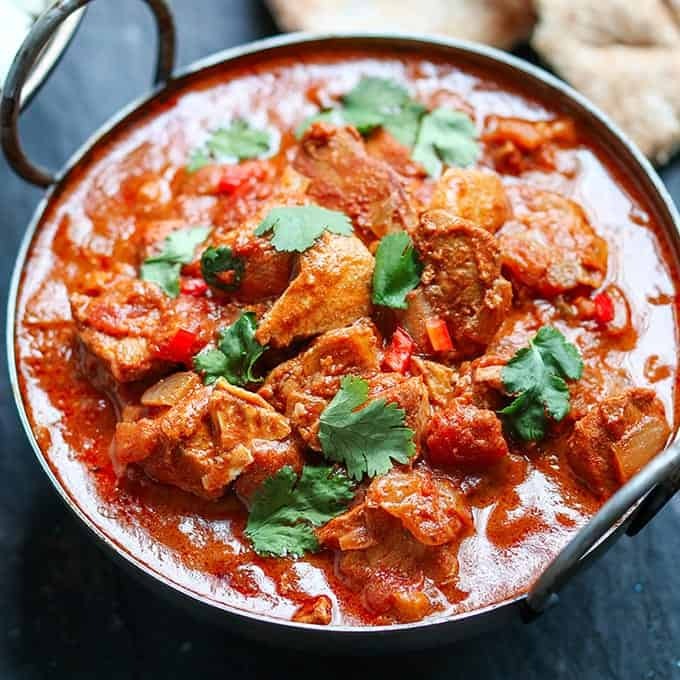 Need something warming for this chilly weather (blooming freezing), and wanted to try something new, this looks perfect and I have all the ingredients in. Perfect???? I made this last night! The first thing I was not sure of is how much is 4 chicken breasts actually – the ones at the store here are very large and I knew if I did 4 that would be way too many. I did 3 and it was pretty good, but I also used 2 medium sweet potatoes cause one didn’t look like enough, and there were no giant ones. I left the ingredients (spices, stock, etc) unchanged. It was very very tasty. 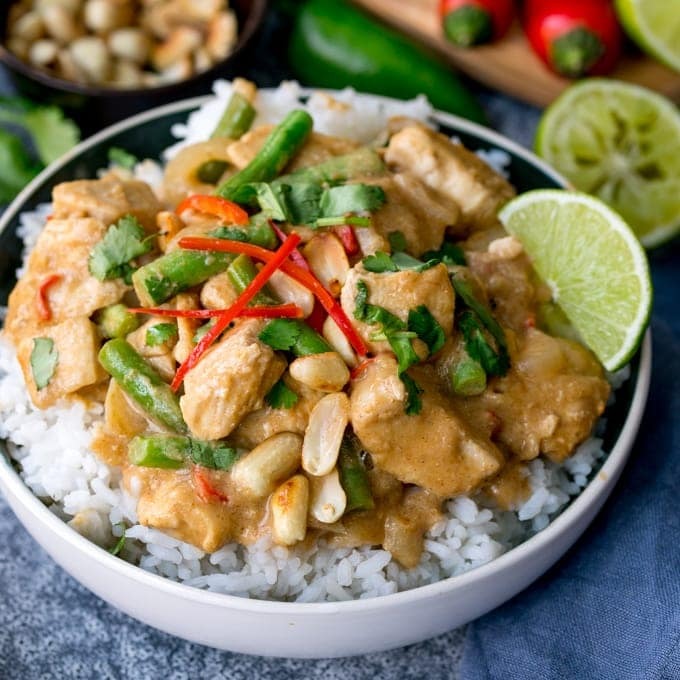 I was, however, expecting a stronger peanut flavor than there was, and it was also not hot – though I haven’t used those chilis before so I was afraid to add more and now I know I could have. The seasonings were good but more mild overall than I expected. Not sure if I just added too much chicken & sweet potato (it didn’t look like a disproportionate amount!) or if I just would prefer it with 1.5-2x the seasonings. However, the recipe was easy to follow and super tasty. Thanks for sharing! Yay! Thanks for letting me know how it went Annika – so glad you enjoyed it! Oh my goodness this was amazing! So easy and beyond delicious. OMG Nicky! Is this real?! Your site looks amazing! =) Soo happy to have come across your path! Ha ha yep, it’s definitely real 🙂 Thanks for checking out the site! This looks delicious! Can’t wait to make it for my family, thanks for sharing.